I wasn’t so sure – and I’m still not. Where I live in Bow, until tonight, it’s been almost a campaign-free zone. 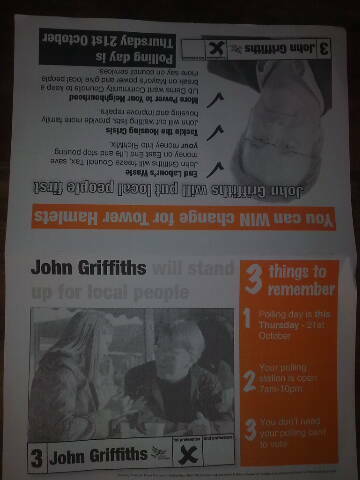 I’d had one leaflet delivered through my door – from the Lib Dems – and that was it. I’d guess that most around here hadn’t even known there was an election taking place. Then Ken Livingstone, in his pre-Maltese period, entered the fray – a move that, ironically, could have helped Labour because it attracted the attention of BBC London and other national media. And tonight, as I walked back from the Tube, I even saw ACTUAL CAMPAIGNERS. Labour ones. 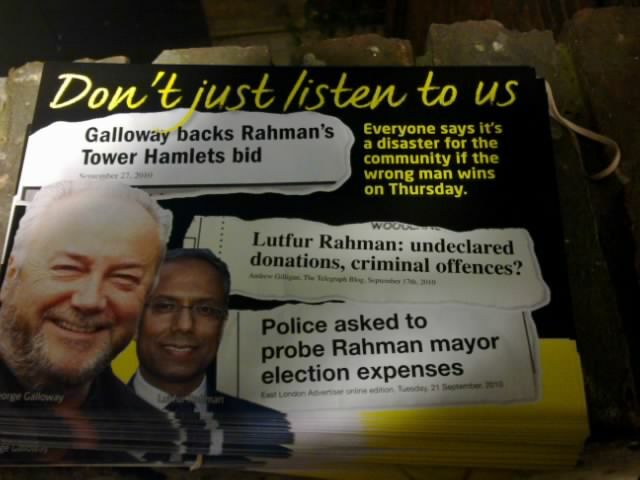 At 9pm, delivering leaflets. 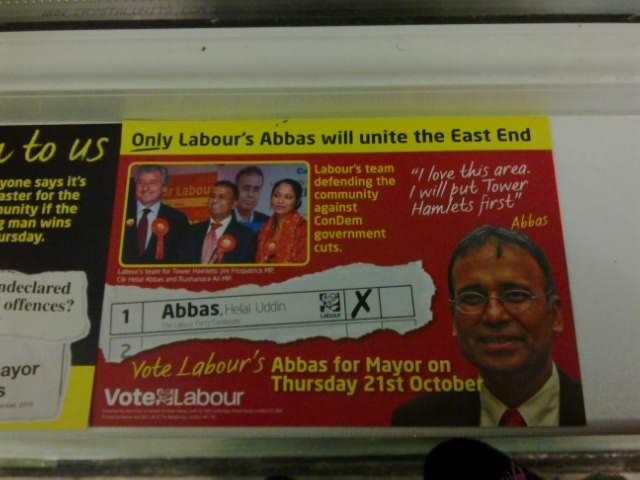 And leaflets that have an edge – ones that try to invoke the spirit of anti-Galloway. They are leaflets that insinuate without any right of reply. Allowable, but just about I’d say. 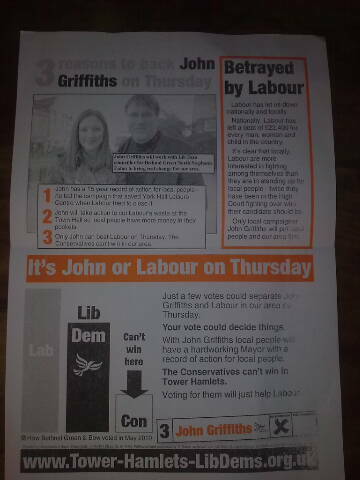 And here’s the Lib Dem leaflet that also dropped on my doormat this evening. Will they be enough? Who knows? Today’s Coalition spending review announced a revolution in local government. Councils, even corrupt and badly run ones, will have far more powers over how to spend our money. That means even more power to a directly elected mayor. So to anyone who moans about bin collections, extortionate council taxes, cowboy council home repairs, dog mess, graffiti, broken pavements, litter, missing recycling bags, soaring service charges, lack of police, or dodgy local politicians: you have a responsibility to spend just two minutes registering a vote.